「Thukimi」today! so I cooked thukimi dish for my son! 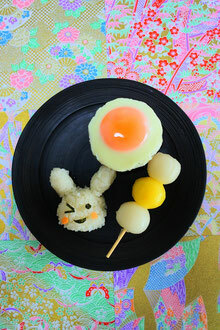 A rice is a rabbit, a fried egg as a moon on a hunberg steak, a stick of thukimi dango (rice cake) the rabbit eyes and mouth are sheets of sea weed I cut and the cheaks are carrot. Thukimi is an annual event in Japan but the days do not fix the same days, it's on 15th SEP this year but the next year is on 4th OCT. On thukimi we enjoy viewing the full moon and to cerablate it and to thank and to pray for a good harves. There is the full moon in AIchi, hope everone has nice thukimi night! !